February | 2018 | Mike Lamberti, From Margate To Cleveland, And Back ! With the season winding down, the DePaul High wrestling team is beginning to hit its peak. The Spartans finished second at a strong District 7, held at West Essex High, in North Caldwell, on Feb. 17. Head coach Keith Karsen’s squad advanced eight to the Region 2 championships, which began on Feb. 21, at Mount Olive High, in Flanders. Four of the eight Spartans were to wrestle in the preliminaries, on Feb. 21 and needed to win to advance to the quarterfinals on Feb. 23. The other four, Nicky Cabanillas, Ricky Cabanillas, Connor O’Neil and Eddie Bierals, won gold at District 7 and didn’t have to wrestle until the quarterfinals on Feb. 23. The tourney wraps up on Feb. 24, with the semifinals, wrestlebacks and 14 championship bouts, all at Mount Olive. The top four wrestlers in each weight class at Region 2 will join the top four wrestlers in each weight class at the other seven regions for the ultimate weekend, the NJSIAA championships, at Boardwalk Hall, in Atlantic City, from March 2-4. Karsen was happy with his team’s performance. Karsen felt his team would be prepared. Roxbury won the District 7 title, with 218.5 points while DePaul was second, with 170.5. Cedar Grove (142.5) and West Essex (127.5) rounded out the top four in a 10-team field. All eight of DePaul’s regional qualifiers appeared in their respective championship bouts. Nicky Cabanillas won the 126-pound title with a 6-0 win, Ricky Cabanillas garnered the Outstanding Wrestler award following his 13-3 win at 145 pounds, O’Neil prevailed at 152, with a second period fall and Bierals won a 3-2 decision to gain the 285-pound title. 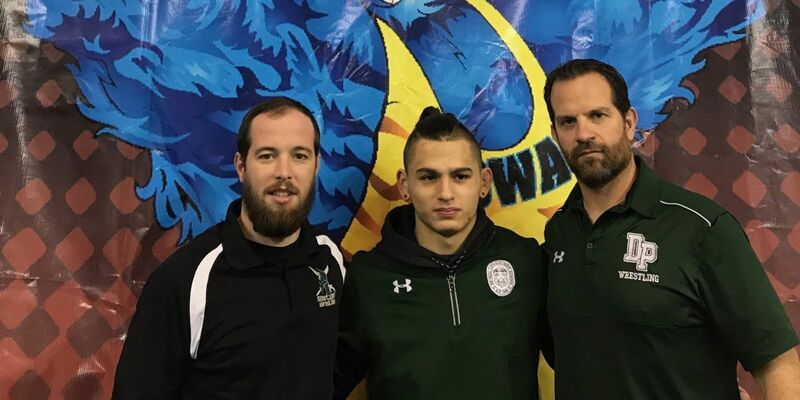 Ricky Cabanillas, who advanced to the state finals last season at 145 pounds, as a sophomore, had finished third in last year’s districts, after losing to Dominick LaRusso of Roxbury, 9-6 in the semifinals. This year, he avenged that loss by a major decision. “You could tell Ricky was fired up for that match,” said Karsen. “But that should show any wrestler that finishing third in a district doesn’t stop you from your ultimate goal. Ricky went on to the state final last year, and this season, he’s more determined to win it all. Finishing second for DePaul last Saturday were Michael Esposito (120 pounds), Joe Ferrandiz (132), Luke McFadden (138) and Michael Pillot (182). 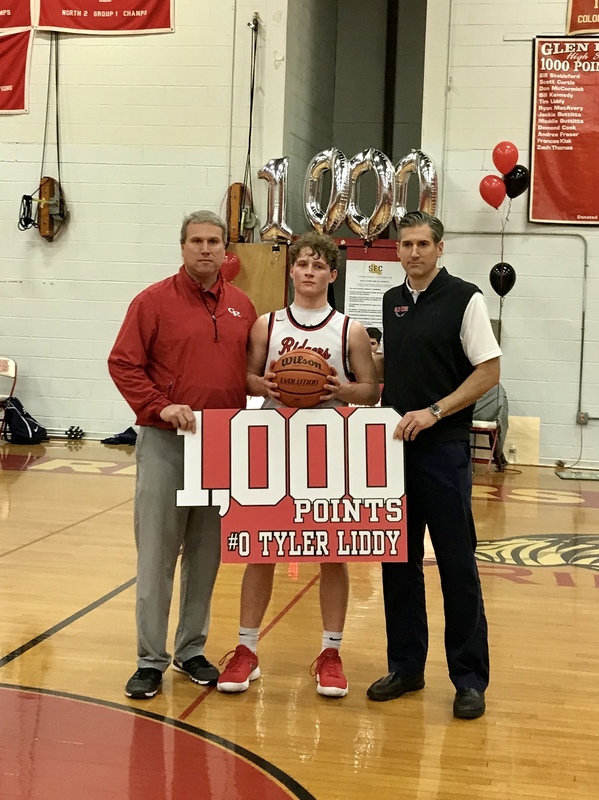 Tyler Liddy reached an historic milestone in the annals of Glen Ridge High basketball, but the senior guard was more interested in how he could further help his team, while also honoring his father. Tyler’s dad is Tim Liddy, the athletic director at Glen Ridge High. When Tyler scored his 1,000th career point on Feb. 13, as Glen Ridge won a 55-46 game at Weequahic High, Tim was there, behind the scorer’s table, and clapping emphatically as the game was briefly stopped. ‘Glen Ridge was 17-7 heading into its regular season finale, at home against Oratory Prep, on Feb. 22. 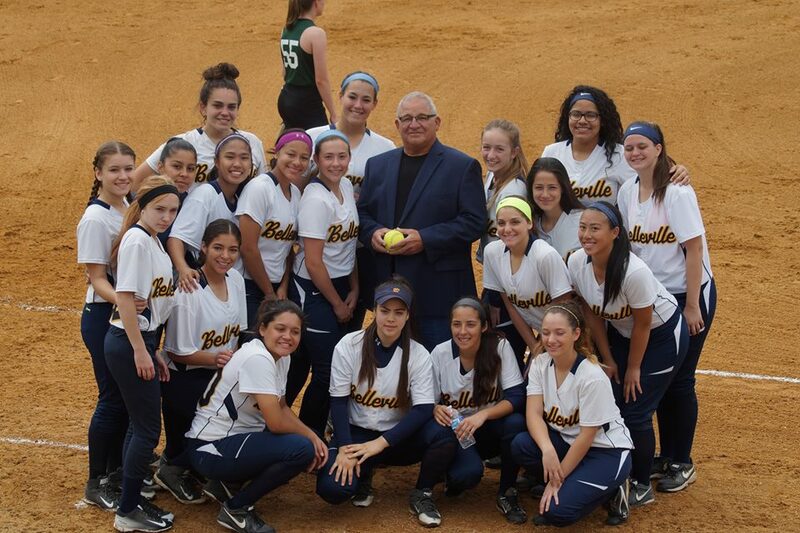 On Feb. 26, the second seeded Ridgers will open the state sectional tournament, by hosting Belvidere, starting at 7 p.m., in North Jersey, Section 2, Group 1. Liddy led the Ridgers with 19 points in the victory over Weequahic and then followed with a tremendous game against Randolph on Feb. 15, with 21 points. “Tyler has battled all season long,” said Glen Ridge coach Liam Carr. “He’s had multiple injuries, and there were times he probably shouldn’t have played, but he’s such a competitor. He’s an excellent scorer, but he does so many other things for us. In addition to being our leading scorer, Tyler also leads our team in assists, steals and rebounds. Tim Liddy was not only a happy administrator, but, of course, a proud father, when Tyler eclipsed 1,000 points. Tyler had a tremendous football season as Glen Ridge’s quarterback last fall. He’s now the ‘quarterback’, so to speak of the basketball team, as its point guard. “As much as Tyler scoring 1,000 points was a big thing for him, just like his dad, winning is the ultimate goal,” said Carr, himself a standout player for the Ridgers and a 1995 graduate. “Tim was a part of a state championship team in 1988 here, and that’s something he always looks back at with pride. 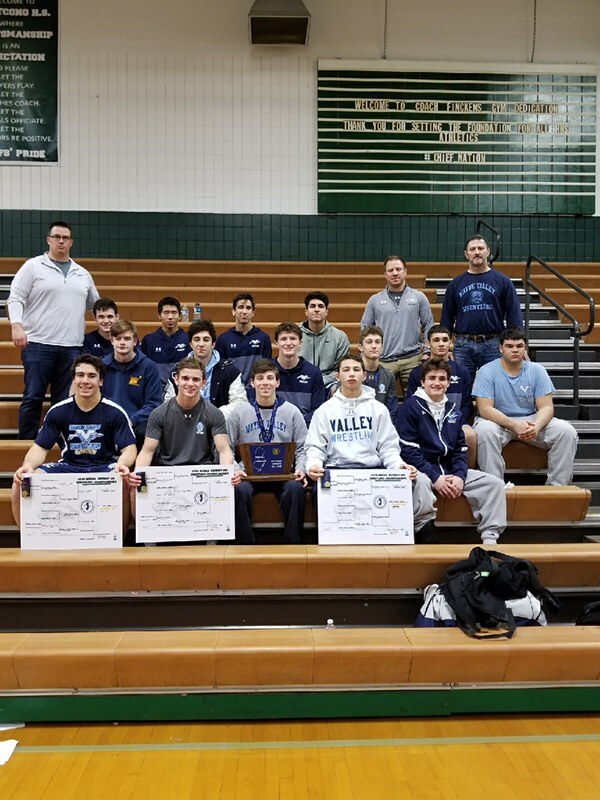 For the Wayne Valley wrestling team, a second straight District 8 title was secured on Feb. 17, as the Indians dominated at Hopatcong High School. Valley scored 190.5 points while Montville was second, with 131, and Passaic Valley finished third, with 128, in a 10-team field. Head coach Todd Schroeder’s squad advanced 10 to the Region 2 championships, which began on Feb. 21, at Mount Olive High, in Flanders. Seven of Valley’s 10 grapplers were to wrestle in the preliminaries, on Feb. 21 and needed to win to advance to the quarterfinals on Feb. 23. Three other wrestlers, Nick Trani, Reid Colella and Nick Duncan, won gold at District 8 and didn’t have to wrestle until the quarterfinals on Feb. 23. Schroeder was obviously pleased with his team’s effort in a big setting. Trani won the 195-pound title with a 9-3 decision in the championship bout. Colella captured the 152-pound crown with a pin in the final and Duncan won a hard-fought 4-2 decision in the finals. “Nick went to Atlantic City last year and knows what it will take to get back there,” said Schroeder. “He’s worked hard to put himself in this position. We feel he’s capable of winning a medal in Atlantic City. This will be a big weekend, for sure. Finishing second for Valley were Hunter Davis (106 pounds), Adam Zindaki (113), Orion Cua (120) and Elijah Lugo (126). Mo Baghal (160), Dan Murphy (170) and Gabriel Ortiz (182) were third in their respective weight class. Schroeder was also happy with the way heavyweight Jordan Botero competed for his team. Kittatinny High School, in Newton, was the site for District 2, where Wayne Hills advanced three wrestlers to the Region 1 championships, which will be held at West Milford High School, on Feb. 21, 23 and 24. 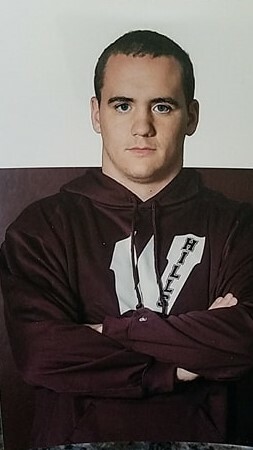 Wayne Hills head coach Dan DiColo announced that three Patriot wrestlers, Pete Dellechiaie (220 pounds), Gabe Dellechiaie (195) and Aidan Broderick (113) qualified for the regions. Pete Dellechiaie was second while Gabe Dellechiaie and Broderick finished third. All three were scheduled to compete on Feb. 21, and needed to win in order to qualify for the quarterfinals, on Feb. 23, and then the semifinals, or wrestlebacks, the following day. Joe Benvenuti and his valued assistant Brian Kapral (right). 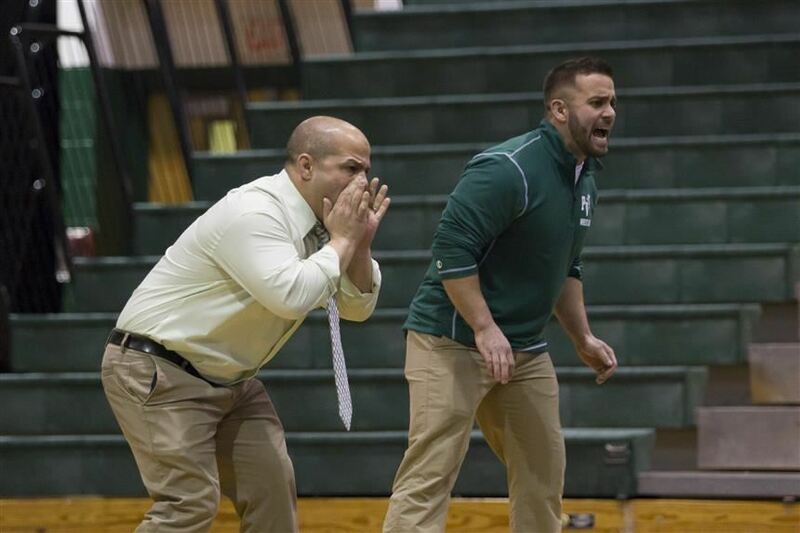 Passaic Valley wrestling coach Joe Benvenuti was named the District 8 Coach of the Year, by his peers, at last weekend’s championship matches. It was the fourth time that Benvenuti has been so honored by his respective district. He was a three-time District 13 winner, with two of the awards coming when Benvenuti was the head coach at West Essex. In 2010, Benvenuti was named Coach of the Year at District 13 and Region 4, while at Passaic Valley. 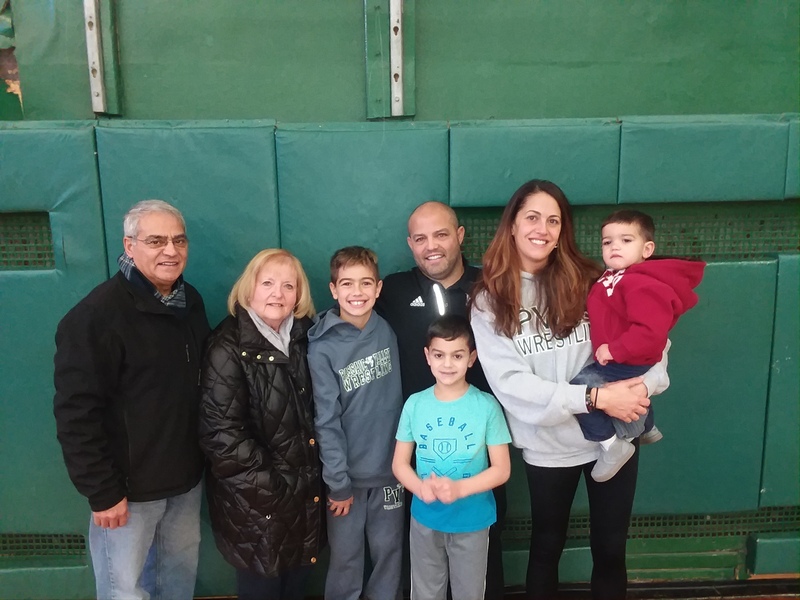 The humbled Benvenuti, who won his 200th career match as a head coach last December against Nutley, credited the award to the PV wrestling program. “There’s no way this happens without the help of a great coaching staff,” said Benvenuti. 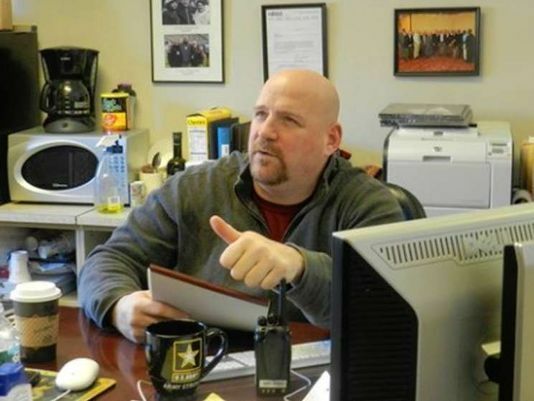 “Brian Kapral has been with me for many years and is as good as they get. Needless to say, my brother, Michael, is someone I can always rely on. And (former PV standout wrestler) Nick Pezzano has done a great job on the coaching staff, too. We have great kids here, tremendous parental support, as well as a good feeder program of young kids who learn the sport and then carry that success into the high school program. Benvenuti led PV to a 15-8 record this season, including wins over four programs that captured NJSIAA sectional championships a year ago. In addition, Benvenuti, a PV graduate and former wrestler for the Hornets, guided Passaic Valley to a state sectional crown in 2010 and 2016. 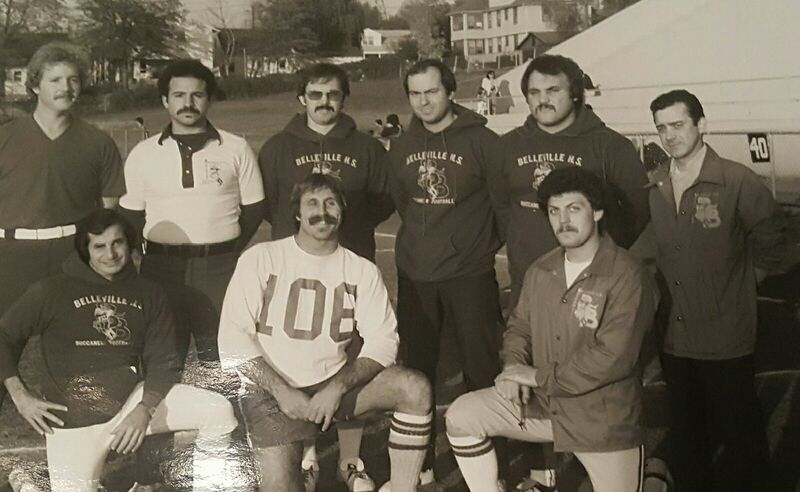 He’s also coached multiple wrestlers to state medals, both at PV and West Essex. Benvenuti also credited his wife, Suzanne, along with his parents and children, for their support. “My family has always been there, and without their support, I wouldn’t be able to put the time in that I do. I can’t thank them enough,” said Benvenuti. Benvenuti is well respected by opposing coaches, as well. 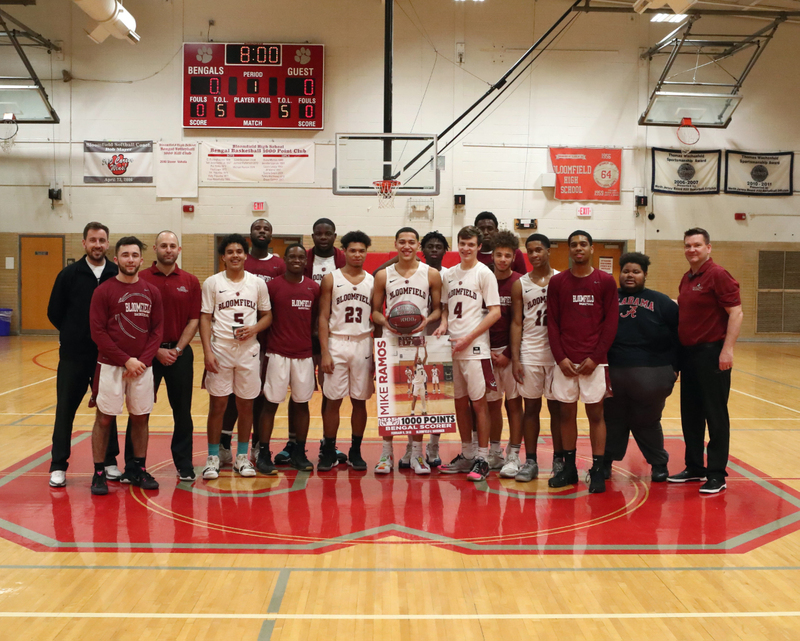 Nutley High’s Matt Schettino joined an elite fraternity, becoming just the fifth player in the history of the boys basketball program to eclipse 1,000 points in a varsity career. Schettino, a senior, needed just one point heading into a game against Cedar Grove, on Feb. 13, to reach 1,000. Schettino had four points in the game, as Nutley won its fourth straight, defeating the Panthers, 65-50. The Raiders were 12-8 heading into a game with Clifton, on Feb. 17. On Feb. 22, Nutley closes out its regular season, at Memorial of West New York and on Feb. 26, the team begins play in the NJSIAA Tournament, at Irvington, starting at 7 p.m.
Nutley is seeded 12th in North Jersey, Section 2, Group 3. If it defeated fifth seeded Irvington, the Raiders would be at fourth seeded Voorhees or could possibly host 13th seeded Parsippany Hills, on Feb. 28. 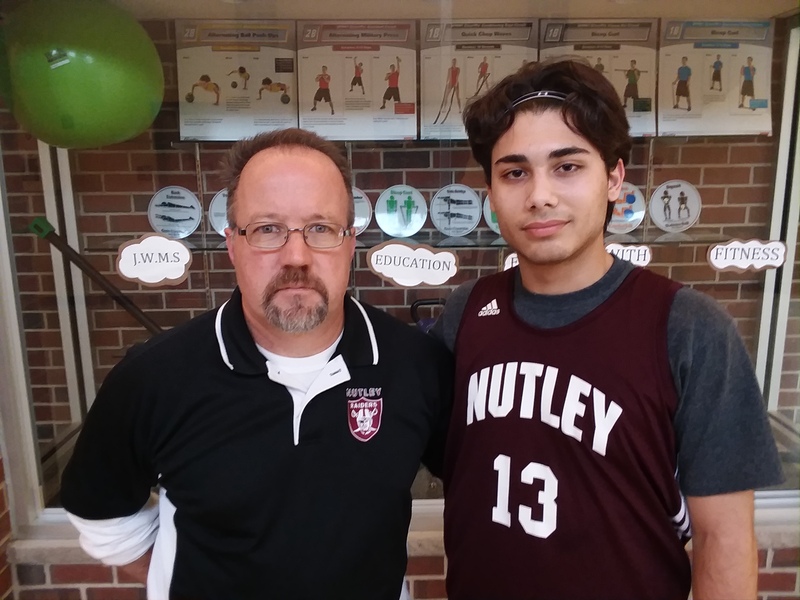 Schettino is the first player in Bob Harbison’s run as Nutley’s head coach to score 1,000 career points. He added his name to a list which includes Dave Siepert, Anthony Christy, Marty Higgins and Bobby Bock. Higgins, a 1988 graduate, is the school’s all-time leading scorer, with 1,855 points. Ironically, Higgins’ son, a junior also named Marty, should join the 1,000 point plateau, probably early next season. Schettino, a 5’11” guard, played football and basketball, growing up. He admits football was his first love, but a series of injuries made him give up the gridiron and focus on the hardwood. The son of Neysha and Daniel Schettino, Matt hasn’t finalized his plans for this coming fall, as far as college, or possibly joining the Military. Harbison was very pleased that Schettino reached the plateau. Schettino was proud of reach 1,000, but credited his teammates first. In reaching an elite milestone, Bloomfield’s Michael Ramos was well aware of the tremendous lineage of the Bengals’ boys basketball tradition. Ramos reached the milestone with a 29 point effort against Barringer, as the Bengals won, 67-40, on Feb. 9, in Bloomfield. Michael Ramos, joined by teammates and coaches, as he’s honored for scoring 1,000 career points. (Thanks to the great Jerry Simon for the photo). Bloomfield head coach Pat Brunner isn’t surprised by Ramos’ play. Ramos has already drawn interest from some major colleges, including Manhattan College and Kent State University. His love of basketball came from his father, who got him on the basketball court at a young age. Ramos is the 10th Bengal to eclipse 1,000 points, and the first in five years to do so. The last to do it was Jameel Patterson. Prior to that, it was Jamil Goodwin, in 2008. While individual accolades are nice, Ramos is thinking ahead, as the Bengals prepare for the biggest part of the season. “We’re having a good year, but now is the time for us to step it up,” said Ramos. Bloomfield was 18-5 heading into an Essex County Tournament quarterfinal game on Feb. 17. In 23 games, Ramos had scored in double figures 20 times, including the last nine games. His season high is 29 points, which came against Barringer twice this year. Crunch time has arrived in New Jersey high school wrestling. And at Passaic Valley, the Hornets are gearing for an exciting three weeks, with the ultimate goal a visit to Boardwalk Hall, in Atlantic City, from March 2-4. Before that happens, however, the trek to A.C. starts this weekend, with the district championships. For PV, that means heading to Hopatcong High, for the District 8 title, on Feb. 17. The top three wrestlers in each weight class at the 32 districts move on to the eight region championships, which begins on Feb. 21. continues on Feb. 23 and concludes on Feb. 24. PV is now in Region 2, which will be contested at Mt. Olive High, in Flanders. The top four wrestlers in each weight class at the eight regions move on to Atlantic City for the state championships. Passaic Valley head coach Joe Benvenuti was pleased with the way his team concluded the regular season. PV won three matches last week, defeating New Milford, Saddle Brook and Cedar Grove, after losing in the first round of the state sectionals, to the eventual champion, Roxbury. The regular season had started with a disappointing loss to North Bergen, but eventually, the team won 15 matches. Passaic Valley head coach Joe Benvenuti (left) and assistant coach Brian Kapral will lead the Hornest into the districts, regions and hopefully, state championships, in Atlantic City. For many years, Passaic Valley was a part of District 13, but with the reshuffling of the districts and regions by the state prior to the 2016-2017 season, the Hornets were moved to District 8. This year, the top teams should be defending champion Wayne Valley, along with Montville and Passaic Valley. In the state sectional match with Roxbury, the Hornets did a good job. The Hornets defeated New Milford and Saddle Brook in regular season bouts and last Saturday, the team rallied to edge a strong Cedar Grove team, 36-32. Heading into the districts, Benvenuti noted some of his top wrestlers should rise to the occasion. “(Team captains) Tom Marretta and Yousef Karmi prevailed in all matches last week, and both had important, hard-fought victories against Saddle Brook,” said Benvenuti. “These two young men have set themselves up perfectly for this end-of-season run to Atlantic City. We fully expect them to be district champions this weekend. “Beside being great on the mat each week, our coaching staff is more impressed with how Tom and Yousef have led this young and inexperienced team throughout the entire season. Since January rolled around, Luke Geleta has been a major contributor to our team. He is someone that I have great confidence in, to become a district champion. Jordan Sconciafurno is another athlete that should make a major name for himself with a district championship. Now that he has gotten a taste of gold, when he won the Passaic County title, he is even more hungry to add to his success. Jeremy Galletta is someone I feel will help his team in a major way on Saturday. He should be seeded very well, and again is another wrestler that got a taste of gold at the county tournament. With both Jeremy and Jordan, the talent has always been there. The missing piece was the focus. These two have matured into confident leaders, and that has been such a positive transformation. In addition, look for Novain Gonzalez, Colby Sellitto, Logan Rodriguez and Zach Ulrich to earn good seeds for this Saturday and make a run to Region 2. “If our boys wrestle with great effort and positive attitudes, I am confident they will not only be a better teammate, but they will also be champions,” said Benvenuti. 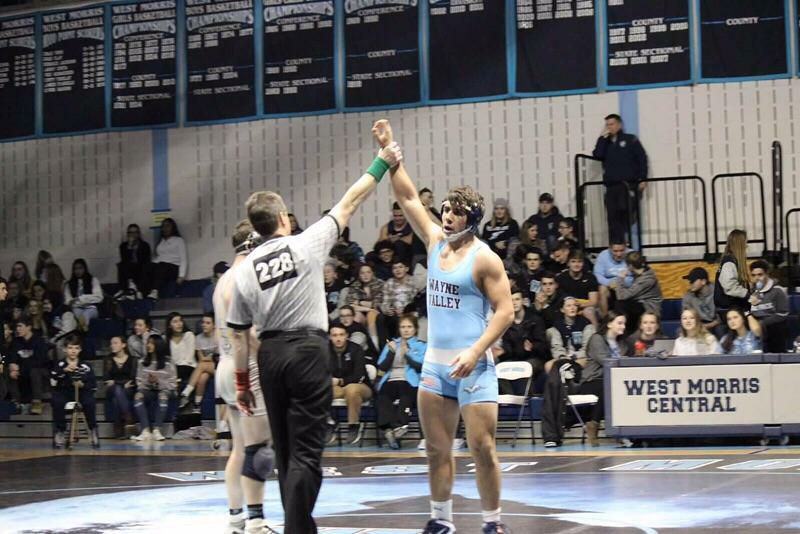 With an impressive 19-6 regular season in the books, the Wayne Valley High wrestling team now prepares for the final stage of a long season. Head coach Todd Schroeder’s Indians will be at the District 8 championships, at Hopatcong High School, on Feb. 17, where the team will seek to defend its championship. The top three wrestlers in each weight class at the 32 districts throughout the state will move on to the eight region championships, which begins on Feb. 21. continues on Feb. 23 and concludes on Feb. 24. Wayne Valley will compete at Region 2, which will be contested at Mt. Olive High, in Flanders. The top four wrestlers in each weight class at the eight regions move on to Boardwalk Hall, in Atlantic City for the state championships, from March 2-4. Last week, Wayne Valley lost in the state sectional semifinals to West Morris Central, 35-21, on Feb. 8. The team then concluded the regular season with three victories, downing Lyndhurst, 67-12, Teaneck, 66-6, and River Dell, 46-24, in a quad on Feb. 10. Schroeder was pleased with the effort down the stretch. Wayne Valley ended the regular season by winning 16 of its last 18 matches. Wayne Valley won the District 8 crown last year, in the first season of the newly formatted district and region set up. The Wayne Hills High School wrestling team finished the regular season on a strong note, winning three straight and five of its last seven matches. First-year head coach Dan DiColo’s Patriots finished 10-15 and will be at Kittatinny High School, in Newton, for the District 2 championships on Feb. 17. District 2 includes some talented teams including Kittatinny, Jefferson and Pope John. The top three wrestlers in each weight class at District 2 will move onto the Region 1 championships, at Wallkill Valley. Among the highlights of Wayne Hills’ season was Aidan Broderick winning the Passaic County Tournament (PCT) crown at 113 pounds and Pete Dellechiaie finishing second at 220 pounds at the PCT. Entering the districts, Dellechiaie had 96 career victories. “After the county tournament, we had a great team win, with two back ups in freshman Chris Brutofsky at 145 pounds and junior Galo Guerra at 160, getting huge wins for our team against Lakeland,” said DiColo. Hills finished the regular season by sweeping a quad, against Dwight Morrow, 66-6, New Milford, 52-19 and Kinnelon, 42-27, on Feb. 10 while also defeating Lakeland, 36-34, on Jan. 31, and Passaic, 61-9, on Feb. 2. Nutley High athletic director Joe Piro and I go back to an era where when you said Belleville vs. Nutley, in local sports matchups, the animus was quick. 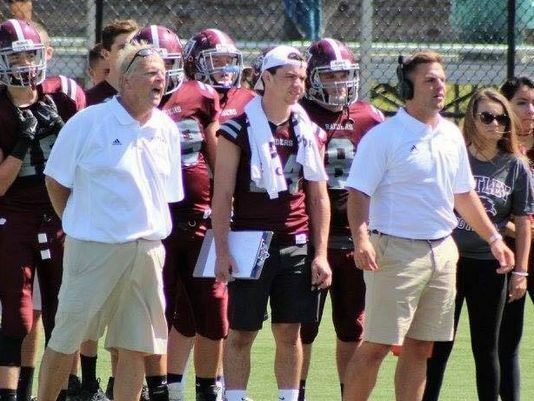 It was a hectic weekend for Nutley athletic director Joe Piro and his staff. And in a way, it still is. 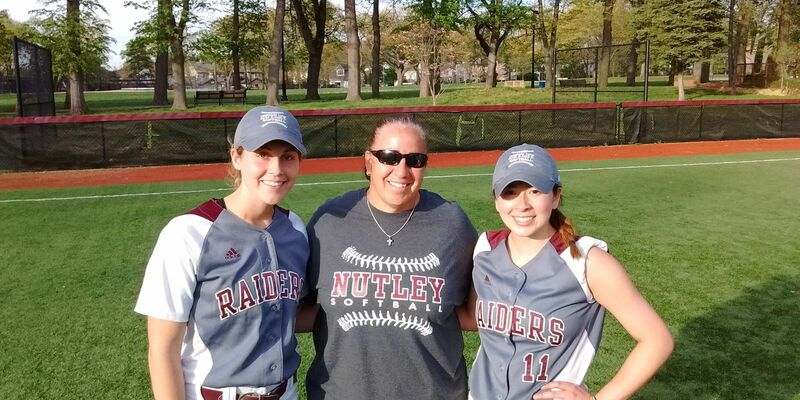 I always kid I wouldn’t wear a Nutley jacket, or anything maroon, for that matter, although I do have a nice Nutley High softball tee-shirt. And I doubt you’d see Joe wearing my Belleville High letterman jacket anytime soon. As a Belleville kid, when it came to Nutley, there was no town I wanted to win against more. And even as a writer, deep inside, it’s hard to not to ‘root’ for the Blue and Gold, when the opponent was/is Nutley. But, as you grow up, you learn that all of us, from the ‘Spaghetti Triangle’, so to speak (along with Bloomfield) were all raised with pretty much the same values. Our parents had the final word, respect was king and there was accountability. And that’s why, as adults, we’re all pretty good friends, and have each other’s backs. With that said, Nutley, which was supposed to host the District 10 wrestling championships this weekend, had to switch venues at pretty much the last minute, and Belleville became the new site. The tournament ended up running well, and Piro didn’t waste time lauding those who helped make that happen. He made it a point to reach out to the police officers on duty at Belleville High, at the end of the tournament. And he publicly thanked the Belleville administration. Here are some excerpts, from Joe’s Facebook post, on Feb. 18, a day after the tournament. “I have to take a moment and give a big thank you to the Belleville school district. In what was probably one of the more scarier times in my career, and in the wake of a very difficult situation for Nutley and the NHS Athletic Department, Belleville came to our aid. Moving any athletic event is never easy, moving a wrestling tournament is a difficult task, moving the state wrestling tournament on six hours notice is next to impossible, unless of course Belleville is your neighbor and (Belleville High athletic director) Marcellino Marra is your friend. “The Belleville staff and police were nothing short of outstanding yesterday. Thank you to (Belleville Superintendent of Schools) Dr. (Richard) Tomko for your blessing and support. To Marcellino Marra, (Belleville High wrestling) Coach (Joe) Pizzi, and the Belleville Athletic Department, I say thank you for opening your doors, gymnasium and locker rooms and treating us like family, and to the Belleville support staff and workers, I say thanks for a job well done. You proved that we may be rivals on the field, but when times are tough we are brothers in arms! With his parents and grandparents smiling proudly, Wayne Hills High senior Mike Zaccone made it official. He’ll attend Hobart and William Smith Colleges, in Geneva, New York, and continue playing football. 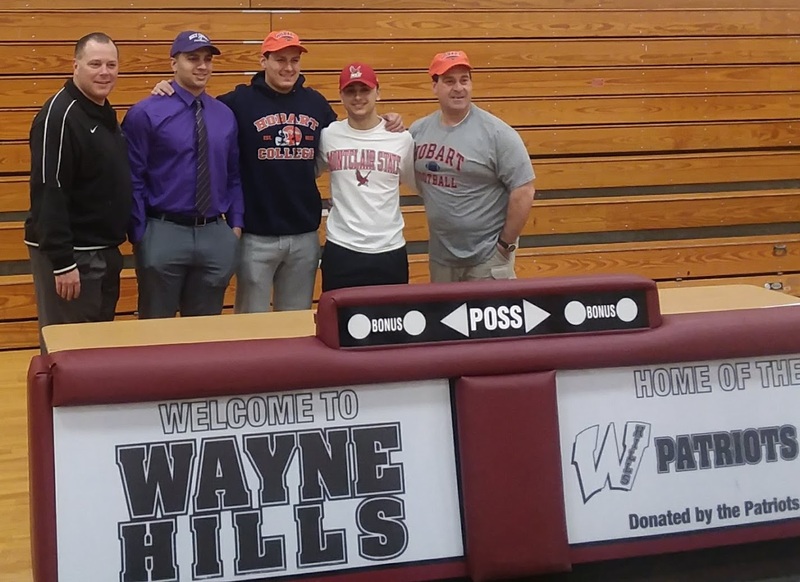 Zaccone, a standout two-way player at Hills who helped lead the Patriots to back-to-back state championship games in 2015 and 2016, including a title two years ago, was joined by his family at Hills’ official signing day, on Feb. 9. Zaccone was clearly relieved he had committed to Hobart. Zaccone was one of five captains for Wayne Hills, which finished 7-4 in 2017 and advanced to the sectional semifinals. Two other captains from that team, Jason Modak and Dario Sirni, joined Zaccone in making their college choices official. Modak, a star lineman, will play football at the College of the Holy Cross, in Worcester, Mass., while Sirni, the team’s reliable kicker, is headed to Montclair State, where he’ll play lacrosse. Zaccone and Modak both plan to play baseball this spring for the Patriots. Hobart had an excellent football season last fall, finishing 7-3. An NCAA, Division 3 school, the Statesmen play in the Liberty League. The school also has an excellent academic reputation and Zaccone, a very good student, is excited about that, as well. 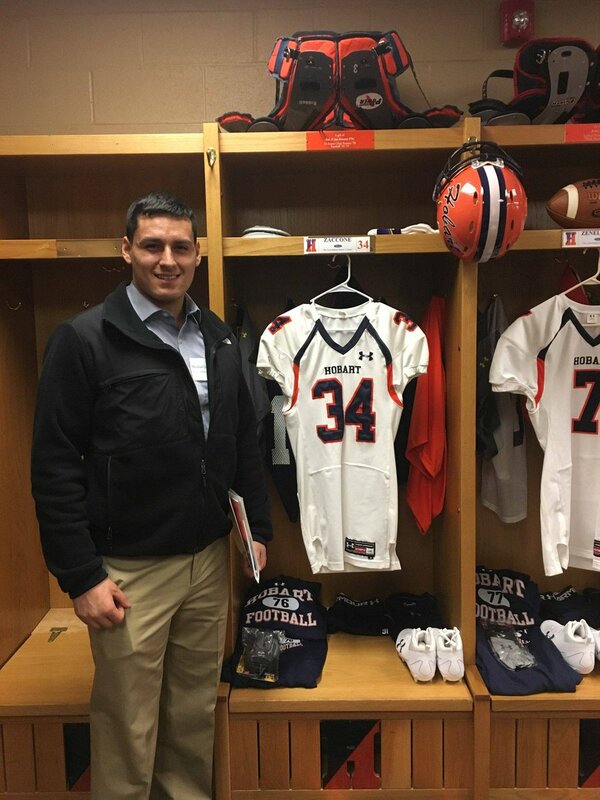 Zaccone is expected to play inside linebacker at Hobart. Between now and the start of practice this summer, he plans to work on his speed and agility, while also continuing weight training, which has always been synonymous with Wayne Hills football. Wayne Hills coach Wayne Demikoff was pleased that Zaccone chose Hobart. Zaccone set the school record for tackles in a season last fall, with 111, while also picking off three passes. In 2016, he suffered a broken leg in the first round of the NJSIAA playoffs, but was able to come back two weeks later and helped the Patriots edge Wayne Valley, 31-24, in a thrilling state final, at MetLife Stadium. Zaccone is the eldest of three children, born to Jodi and Michael Zaccone, Sr.. The elder Mike Zaccone has served as an assistant football coach at Hills since 2012, and is also a Wayne police officer.